Caprese Chicken Roll-Ups recipes for you Here this recipe will serve for 4 peoples. 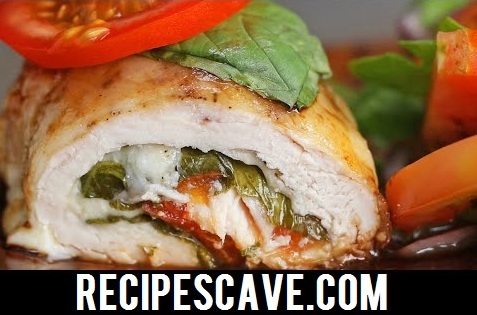 Just simply follow the bellow steps how to cook Caprese chicken rollups recipe. 2. In a saucepan, heat balsamic vinegar and honey over high heat. Stir until sauce reduces to ⅓ cup. Set aside. 3. On a cutting board, slice the chicken breasts in half horizontally. 4. Cover chicken with a piece of plastic wrap. Using the rough side of a metal mallet, pound the chicken until ½-inch thick. Repeat with remaining breasts. 5. Drizzle olive oil over pieces of chicken and season with salt and pepper. 6. Place 2 slices of mozzarella on each piece of chicken. Spoon ¼ cup of diced tomatoes on each piece of chicken. Place 3 pieces of basil on each piece of chicken. 7. Roll up the chicken, making sure the ingredients are tucked under the breast and not pushed out the sides. 8. Place the roll-ups in a greased baking dish. Drizzle each roll-up with more olive oil and sprinkle with salt and pepper. 9. Bake for 15 to 20 minutes, until internal temperature reaches 160˚F (71˚C). 10. Place one slice of mozzarella on each roll-up. Broil for 5 to 10 minutes until the mozzarella has melted over the chicken.